my husband, bob, and i recently visited (some of) the eighteen surviving palladian villas in the veneto region of italy. now, part of a unesco world heritage site. a pediment above a portico with three arches. a pediment above a portico with columns. a pediment above a two-story portico with columns on both levels. brick and stucco, instead of stone and marble, construction. interior walls decorated with frescos, instead of hung with tapestries. using mathematics to design the arrangement, shape, size, and height of rooms. 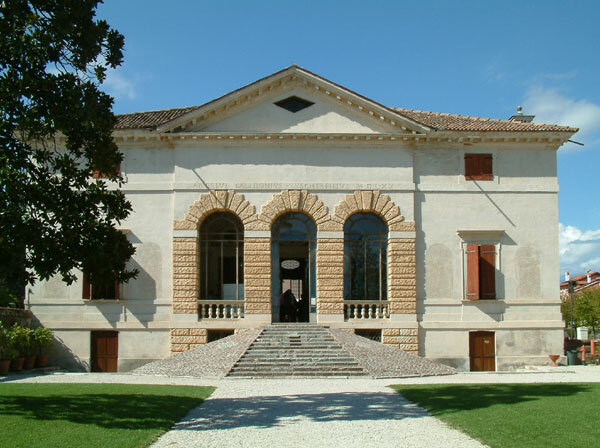 palladio probably used number theory as an architecture and interior design tool. particularly, the ‘perfect numbers’ 6 and 10, which are the proportions of the human body. palladio’s influence spread following the publication of his architectural treatise i quattro libri dell’architettura (the four books on architecture) in 1570. the treatise, which has been widely translated and periodically reprinted since then, outlines his architectural principals. standing in a space designed by palladio has been described as an uplifting experience. the harmonious arrangement and balanced proportions of the rooms make you feel calm, composed, collected, and connected. i experienced this feeling standing in the sala centrale (central hall) at villa pisani bonetti, located along the brenta river in bagnolo di lonigo. the size, shape, and height of the hall is atypical of late renaissance architecture from the veneto region. the large hall is t-shaped. with a two-story barrel vaulted ceiling and thermal windows, like an ancient roman bath. the materials and decoration are also atypical. frescos of grotesques decorate the cross vault. and, frescos of scenes from ovid’s metamorphoses, attributed to francesco torbido (about 1486-after 1546), a pupil of giulio romano (1499-1546), decorate the barrel vaults. villa pisani bonetti was the first agricultural estate that palladio designed for a venetian, instead of a vicenzan, patron. the facade facing the river has twin towers, centered by a rusticated masonry portico with a pediment above three arches. recent restorations include reopening the thermal window on the courtyard facade, which originally faced the (now demolished) barchessa (barn). and, re-excavating the semi-basement. according to the four books on architecture, villa godi malinverni, located in lugo di vicenza, was the first villa designed by palladio. following our visit, villa godi malinverni was hosting a wedding. so, i decided that it would be impolite to take many photographs. villa godi malinverni is also famous for it’s frescos by mystic painter, gualtierro padovano (circa 1510-1552). as well as classic painters, battista del moro (1512-after 1568) and giovanni battista zelotti (circa 1526-1578). zelotti also painted some of the frescos at villa caldogno in caldogno, including the tragedy of sophonisba and the triumph of scipio. did you notice the window seats? window seats are another common component of palladian interiors, including the interiors at villa pisani bonetti and villa saraceno. villa caldogno, which is currently undergoing a renovation project, is now used as a municipal building. giovanni antonio fasolo (1530-1572) painted the frescos in the sala centrale (central hall), which is now used as a meeting room. the telamons (giants) around the perimeter of the hall imitate the pillars along the perimeter of a loggia. the monochromatic giants frame polychromatic genre scenes, including a card game, a dance, a concert, and a banquet. del moro painted similar giant caryatids (female figures) around the perimeter of the sala delle muse e dei poeti (room of muses and poets) at villa godi malinverni. a careful restoration project by the the landmark trust preserved not only the frescos, but also some of the original plaster on the interior and exterior of villa saraceno in finale di agugliaro. some of the original intonaco (plaster topcoat) still covers the brick masonry on the south and west sides of the exterior. the entire exterior is plaster, except for the stone surrounding the windows and doors. palladio sited villa saraceno with a south-north, indoor-outdoor orientation, designed for ventilation and to frame the view of the dolomite mountains through the three openings of the portico. the flat, wood beamed ceiling in the sala centrale (central hall) is characteristic of late renaissance architecture from the veneto region. but, the hall is t-shaped, instead of quadrilateral, which is more atypical. the cycle of frescos around the perimeter of the hall depict the tragedy orazia by pietro aretino (1492-1556), who possibly wrote the play at villa saraceno. instead of arches or columns, both the portico and rear entrance at villa poiana in poiana maggiore have serliana. the tripartite openings, shaped like ancient roman triumphal arches, were named after italian mannerist architect, sebastiano serlio (1475-1554), who published his treatise, tutte l’opere d’architettura et prospetiva (all the works on architecture and perspective), in installments from 1537-1575. book III, published in 1540, described and illustrated ancient roman buildings along with the work of italian renaissance architect, donato bramante (1444-1514). palladio’s predecessor, bramante, designed a serlian arch for the nymphaeum in genazzano, near rome, in 1506-1510. yet, serliana are now commonly called palladian arches or windows. like bramante, palladio pierced the lunettes above the arches with five oculi. 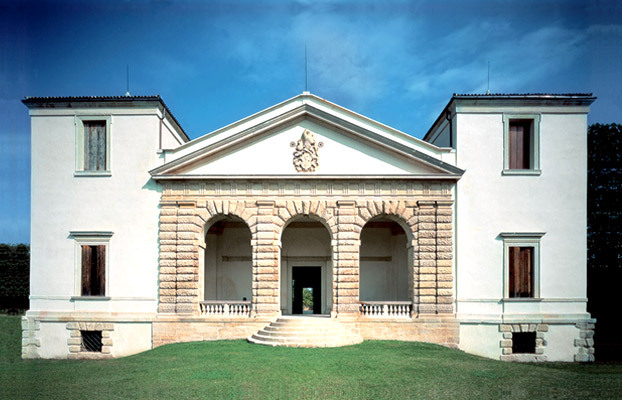 villa almerico capra in vicenza, also called la rotonda, is considered the universal icon of palladian architecture. upon approach, villa almerico capra appears both geometric and volumetric. the floor plan is completely symmetrical. a circle, within a square, within a quadrate cross. the domed circular hall, the corner rooms and porticos, and the stairs are centered within (imaginary) concentric circles. the four corners of the building are oriented towards the four cardinal directions. and, the four facades have identical elevations, each with a pediment, columns, portico, and stairs. palladio designed two villas with this floor plan. but, only the barchessa (barn) was built at villa trissino in meledo di sarego. the four books on architecture attributes the statues on the roof and the stairs to giovanni battista albanese (1573-1630) and lorenzo rubini (active 16th century). the interior was decorated with frescos and stuccos during the early 17th century. regrettably, photographs were restricted in the interior.